For Reece Bearnes, life is all about making positive changes. And in the past two years, he’s made a big one – moving to Newfoundland and Labrador and settling into a new career as Eastern Health’s Director of Medical Services. On a professional level, he continuously looks for opportunities to make effective and sustainable change within our organization. Reece believes in the importance of collaborative leadership, and supports system transformation through the full integration of administrative and physician leaders. He has a passion for system performance and accountability, and has implemented significant change at Eastern Health resulting in improved waitlist management, patient flow and access to care. With that in mind, Debbie recommended Reece for the Robert Zed Young Health Leader Award, presented annually to a young Canadian healthcare leader who has demonstrated leadership in improving the effectiveness and sustainability of Canada’s health system. 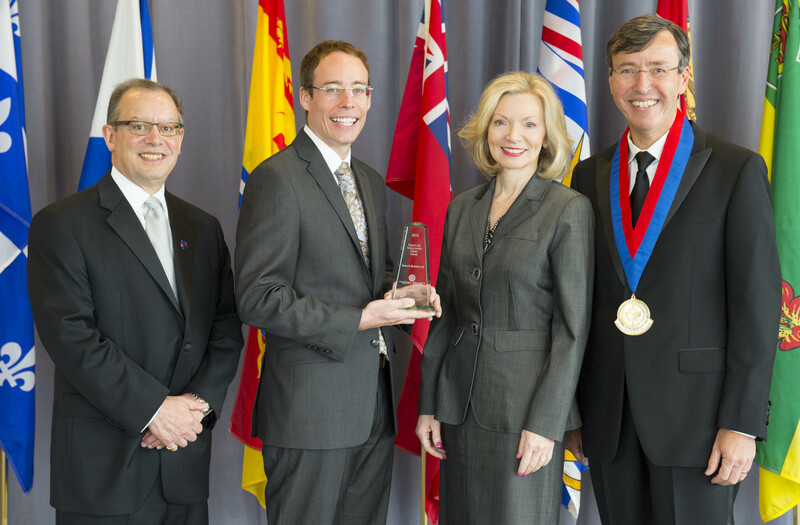 He received the award at the Canadian College of Health Leaders’ 2015 National Awards Gala, held in Charlottetown, PEI in June of this year. “In Medical Services at Eastern Health, our top priority is to provide physician services across the region to those we have the privilege of serving,” he says. “Our organization faces many geographical challenges, and Reece has been instrumental in bringing stability to rural medical services,” Debbie Walsh adds. A native of Cape Breton, NS, Reece grew up surrounded by friends and family who played various roles in the healthcare system. “At home, Mom was an intensive care nurse and it was common to debate the challenges in our system that affect patients and families,” says Reece. 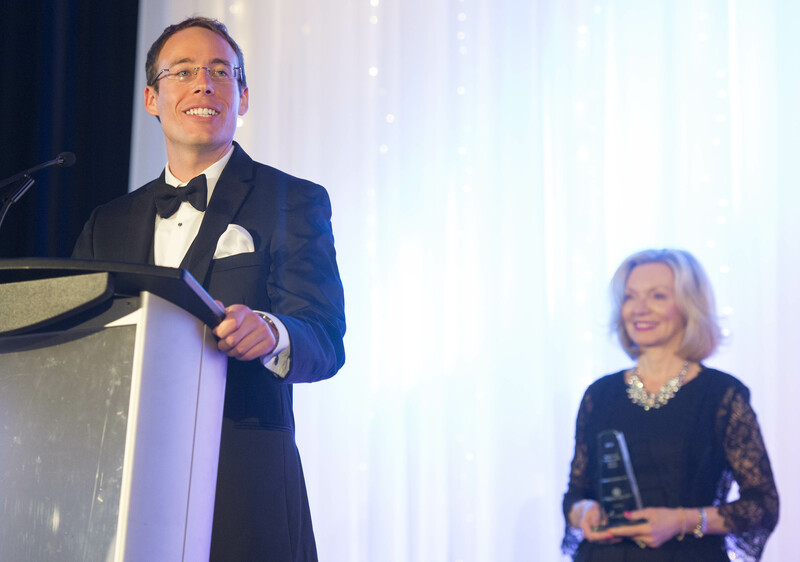 As a young health care leader, Reece has earned a valued reputation for his abilities and skills and is no stranger to professional accolades. While working in Halifax, he was the first recipient of the Capital District Health Authority’s Health Administration Fellowship in 2011. Since that time he has been active in the healthcare leadership community. In addition to being responsible for establishing, maintaining, and enforcing professional standards for Eastern Health’s 750 medical staff, Reece still finds time to serve as President of Dalhousie’s Health Administration Alumni Association. In this role, he has led the establishment of a mentorship program for young health leaders. He also recently participated as a speaker in the Canadian College of Health Leaders’ national webinar on mentorship, and chairs a public education series on healthcare related topics. L-R: Ray Racette, President, Canadian College of Health Leaders, Reece Bearnes, Sharon MacDonald, President, Compass Group Canada, and Brian Schmidt, Chair, Board of Directors, Canadian College of Health Leaders. Change seems to be a constant for Reece. While this latest award recognizes his work to date, he’s looking forward to what comes next. “We need to create our future – we can’t sit back and wait; hope cannot be our plan,” he says. “We need to be very intentional, and work to be sure we have the right model. This story was written by Robyn Pike, a communications specialist with Eastern Health in St. John’s. This is a very good news story.I think if easternhealth could utilize this attitude in the Management of it’s managers we could become much better at being Engaged in the process of making where we all work a better place for the patient and staff. Yes this is very positive news. Congratulations Reece.